One of the most popular questions we get a Lean Labs centers around the creative barrier of content marketing. Coming up with compelling, helpful content that is valuable to your customers is arguably the most difficult challenge marketers face. Creating content for the sake of creating more content will bring next to nothing in return. As a matter of fact, creating irrelevant content will probably hurt you more than help. Most of your competitors are probably marketing content of some sort. Your content needs to stand out in quality. It also needs to be relevant; not just to your company, but to your target customers. I’m going to show you how to get over this obstacle easily, but first we need to know what kind of content you should be creating. Then, we can talk about how to come up with a lot of high-quality content ideas. There’s too much hype around being a “thought leader.” Having revolutionary ideas is great, but if they aren’t ideas that help your customer, you don’t need to create content about them. As a business, your first focus needs to be on helping the customer get what they want. When it comes to content marketing, this often means answering their questions. It’s that simple. When your customers are looking for a solution you offer, the first thing they normally do is look for information, not buy buttons. They want to know which product is best, what it costs, and how it will make their life better. Your content marketing should provide them the answers they are looking for. If your content isn’t helpful to your customers, what good will it do you? The answer is none. You’ll just be contributing to the noise. It won’t be long before one of your competitors creates this content and builds trust with customers that should be yours. So make the commitment for the next 100 pieces of content you create, every one of them will be aimed at helping the customer and answering their questions, not pitching your product. Face it, we’re all proud of our product or service. At Lean Labs, we create high-end responsive websites and effective inbound marketing solutions for deserving clients. But if all I do is tell you how we’re the best, you’ll never trust a word we say. Customers don’t want to be sold to, they want to find a company they can trust. Admit it, if you found a car salesman that would talk you out of buying cars that were a bad fit for you, wouldn’t you get all your car buying advice and buy from only him? The same is true about all businesses on the web. If your website is pitching from start to finish, your turning away most of your potential customers. Conversely, if your website is genuinely helpful, allowing customers make the best decision, you build trust and, more importantly, revenue. The best benefit of being helpful is that your customers are more likely to become brand advocates. Now that we’ve established the kind of content you need to be creating, let’s talk about how to brainstorm topics that actually matter to your customers. This practice should be done periodically to make sure your content strategy is still relevant to your customer. If your customers have questions, you need to be answering them on your website. Create a huge list of questions that your customers have asked. This is an exercise your entire team should be involved with, including sales and customer service associates. Host a 30 minute brainstorming session in which every team member can offer up questions they get asked by customers. At this stage, don’t worry about good or bad questions, just take down as many as absolutely possible. Build up a list as big as possible with as many questions as you can think of. Create a system for customer-interfacing team members to keep a running tab on questions they field. You can mine your support requests for questions as well. Why are you more expensive than x competitor? Can your product do x? What’s the best way to do x? Which of your products is better for me? We always open a Google Docs spreadsheet, and sit around a table of team members and have them fire questions they’ve been asked. 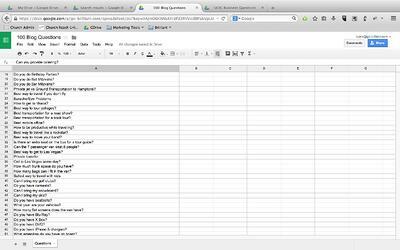 We write down all the questions, even those that are very similar, into the spreadsheet. Now that you have your list of questions, you know what customers are asking. Now, you need to prioritize them by importance to the buying decision. The colors of your new line of stadium seat cushions may not be as important as how much they cost or how comfortable they are. We want to answer the most valuable questions first, before we answer the less-important questions. Take the spreadsheet, and go question by question assigning a value between 1 and ten to each question. In step 3, we’ll use these values to quickly prioritize what content needs to be created first, and which topics will go into a backlog. Print out your prioritized list of questions. It’s time to build a list of titles. 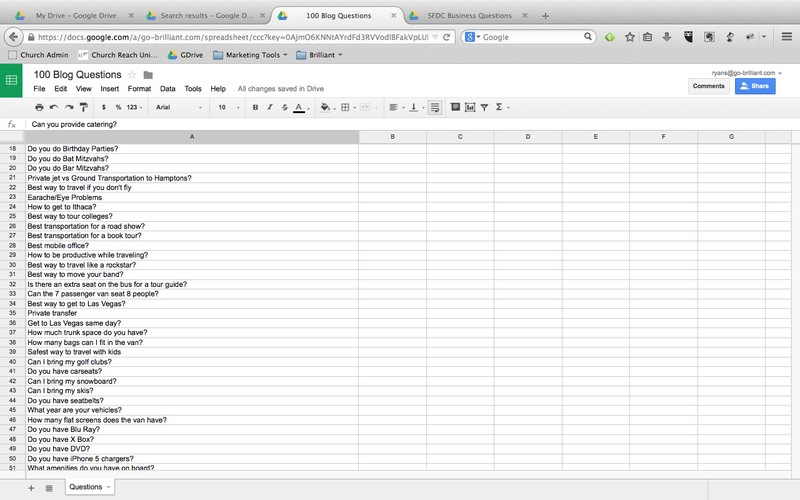 For this, you’ll want to create another spreadsheet for your content titles. Question by question, come up with titles for content pieces that would best answer that question. Depending on the amount of questions you had in your list, this could take a while to go through them all. If your list of questions is large, write out 100 topic titles for the top priority, and then save the list to bee revisited after you’ve published those first 100 articles. At Lean Labs, we can build a topic list with well over 100 compelling, valuable titles in about 45 minutes. As you perfect this process, you’ll have more content ideas than you could possibly create. There is more ways to provide customers with content beyond just a blog. You could publish a blog post, record a podcast, create an infographic, or produce a video. For some retail-oriented businesses, video can be a powerful content tool. For the PGA Tour Superstore, they use video to highlight products all the time. Beyond just writing about them, or showing photos, their videos give customers an intimate view of the product. Assign a content type to each title you’ve created. At Lean Labs, we see a lot of companies come up with a great list, but they never get around to creating the content. It happens way too often. These questions are things your customers want to know. You are being negligent if you don’t create this content. The best way to ensure your ideas actually get published, is to set dates and hold yourself and your team accountable for getting each piece done on time. As you go through your list of 100 topic ideas, you’ll find some pieces that work well, and others that don’t. When you’re getting ready to do the second round of brainstorming, consult your statistics and see which kind of posts are performing the best. Then, as you build out your next list of topics to cover, try to capitalize on the types of pieces that perform best. What are some ways you brainstorm content ideas? Let us know!